Waveform function generator channels on a Digilent device can generate both standard and arbitrary waveform functions. For more information on waveform types, see Waveform Types. This diagram shows you the pin configuration on a typical Digilent Analog Discovery™ device. The yellow and the yellow/white lines represent the waveform channels, marked by W1 and W2 on the device. 1+ (scope channel 1 positive) to WI through a 1K resistor. 1– (scope channel 1 negative) W2 to GND. 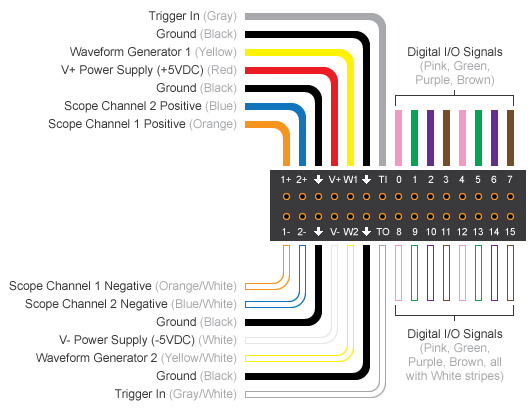 This diagram depicts these connections on a breadboard. Unlike analog input channels, the function generation channels control their own waveform frequency. If your session contains both function generation channels and any other types of acquisition channels, the function generation channels will have their own frequency and all other channels will inherit the sessions frequency. 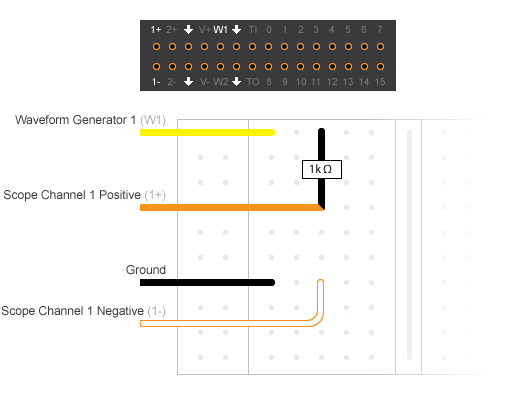 If you have analog input channels in the session with function generation channels, the analog input channels start first and act as a trigger for function generation channels.